Today in How to Get Battlepacks in Battlefield 1, we will show you how you can get Battlepacks is this action packed first person shooter game, Battlefield 1. Battlepack system has changed a lot from Battlefield 4 and Battlefield Hardline. But from the first look, it does seem to be a good improvement overall. Battlepacks will now focus almost completely on customization, you will get rewarded with Battlepacks randomly after certain matches. And every time you open a Battlepack you will get a weapon skin, that’s guaranteed. The weapon skins come in three rarity; Special, Distinguished and Legendary. So now the question is, how can you get Battlepacks in Battlefield 1? Before we tell you how to get plenty of Battlepacks, you should know one more thing about the Battlepacks. 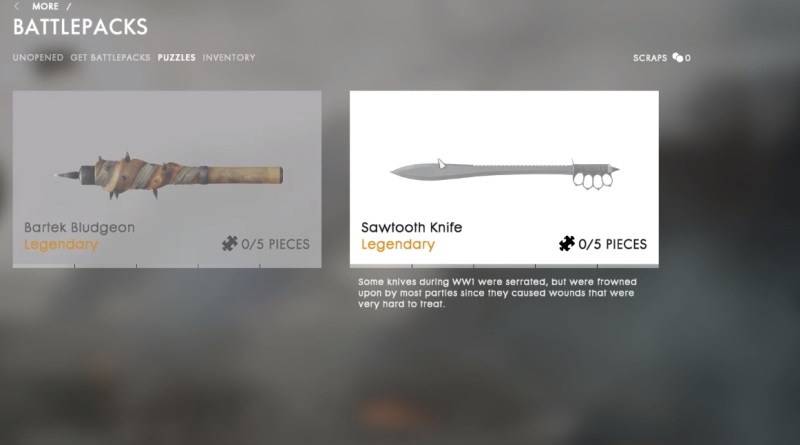 Aside from weapon skins, there’s a chance that a Battlepack might contain a piece of a craftable melee weapon. You will need to collect all the pieces of a certain melee weapon to unlock it in the game. And apparently beyond weapon skins and melee weapon parts, there’s another item that you can get from Battlepacks. But DICE aren’t officially telling us what that is yet. The normal or basic way to get Battlepacks in the game is by playing the multiplayer. But remember one thing that you have to complete and finish your matches in order to get Battlepacks, more XP and XP multipliers. You will not get Battlepacks after every match, but if you play well and end up in top 3 spot you will get it. Our experience was with the Battlepacks is that you have to play better in your matches. You can get a Battlepack at lower score but it is pretty rare. The second way to get Battlepacks in Battlefield 1 is to to buy them. Yes, you can buy Battlepacks in the game with in-game currency called Scrap. When you open Battlepacks you will get two options. You can either keep the skin or turn these skins into Scrap by trading them. When you have a good amount of Scraps, then you can buy Battlepacks without having to wait for to randomly given to you as a post match reward. As a post match reward you will only get normal Battlepacks. If you want to get Enhanced or Superior Battlepacks you will have to buy them using Scraps. You can get Distinguished weapon skins from Enhanced Battlepacks. But if you want Legendary weapon Skins then you have to save a lot more Scraps to buy Superior Battlepacks. Now, if you want plenty of Battlepacks in the game you have to play the multiplayer and get as many regular Battlepacks as possible and then trade them for scraps to buy Superior Battlepacks. You can read our Top 10 Battlefield 1 Multiplayer Tips guide to be a better player in your multiplayer matches. So, just keep playing the game, earn Battlepacks turn then into Scraps and buy Enhanced/Superior Battlepacks and the cycle then just continues round and round. 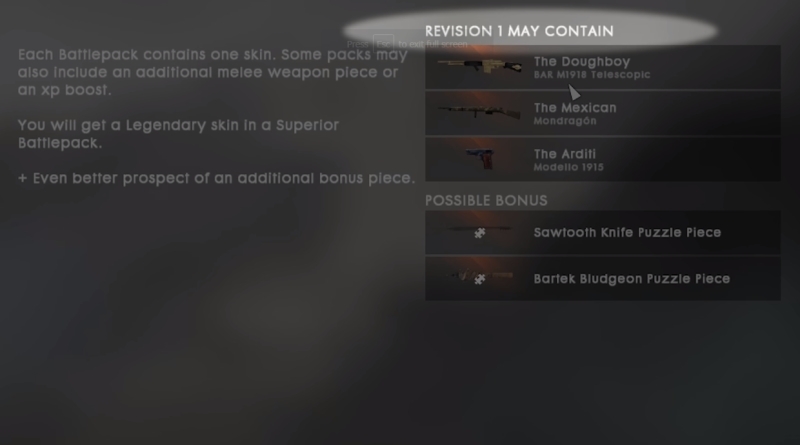 Battlepacks that you earn through the game or buy with your Scraps, will have different Revisions. 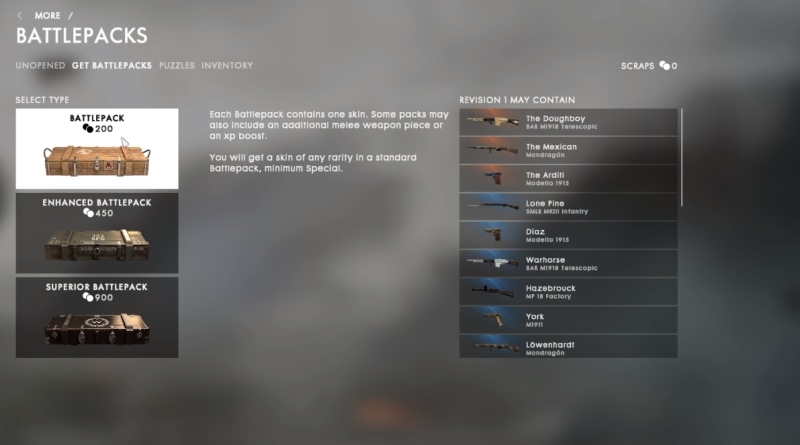 They will have different list of skins and these Revisions will be rotated regularly so you don’t keep opening the same pack and getting the skins for your weapons every single time. So you can save your scraps and wait for the next revision to come in with different skins and other cool items. You may get the skin that you’ve been waiting for so long in these revisions. This revision system is pretty good. Now you can keep the stuff you want, scrap the stuff that you don’t and you can save Scrap to buy different Battlepacks as well.